The Intertrust Cayman Islands Marathon is approaching and with it, the largest Under-11 running event on island, The Milo Kids Fun Run. Organizers of the race are encouraging children to register and complete their very own kid-friendly marathon. In 2012, organizers introduced a marathon runner’s log that youngsters can use to keep track of their activity leading up to the Kids Fun Run. The goal is to have completed a full 26.2 mile marathon when they cross the finish line on Dec. 6. The Milo Kids Fun Run has become extremely popular. The first 25.5 miles of the marathon can be completed by running, walking, swimming and hiking, and kids can have their parents, PE teacher or another adult sign their log verifying that they have completed each mile. After completing the 0.7 mile Kids Fun Run and crossing the finish line, successful participants can boast that they have officially completed a marathon. Last year, there were dozens of children who completed the running log. Children who complete the running log will also be eligible to enter a draw for some great prizes from the run’s sponsor, Milo. The logs can be dropped off at Packet Pickup on Saturday, Dec. 5 at The Westin Resort from 9 a.m. to 3 p.m.
“This race was originally started in 2007 with the support of the Ministry of Youth and Sports who recognized the importance of getting our kids active and supporting a healthy lifestyle, and we are grateful for their continued support over the years,” said Kelly. “Milo came on board shortly after and we’re excited about the extra incentives that they are giving our kids. The Milo Kids Fun Run is open to primary schoolchildren ages 5-11 years old. Registration is free and students are encouraged to register online. Kids Fun Run registration includes a runner’s bib, T-shirt, finisher’s medal and a Milo swag bag. 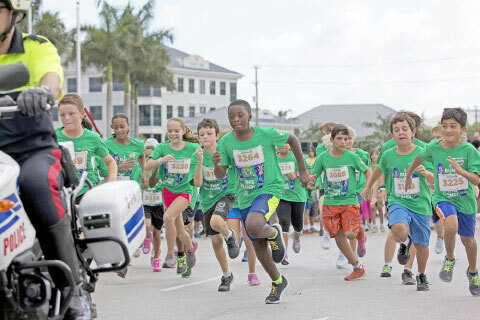 The race begins at 10:30 a.m. in front of the Government Administration Building on Elgin Avenue, and kids will run the course to the finish line on Harbour Drive where they will receive medals and be able to sample tasty Milo products. Registration for the 2015 Intertrust Cayman Islands Marathon, Half Marathon, Team Relay and Kids Fun Run is open online at CaymanIslandsMarathon.com. Walk-in registration can also be done at the Kelly Holding office. For more information, email info@CaymanIslandsMarathon.com or call Brittany Kelly on 623-8822.